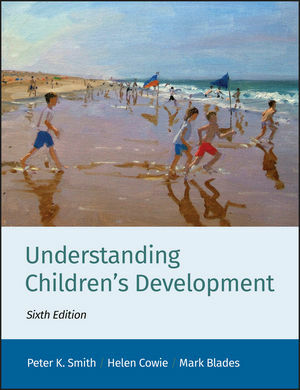 Understanding Children's Development is the UK's best-selling developmental psychology textbook and has been widely acclaimed for its international coverage and rigorous research-based approach. This dynamic text emphasizes the practical and applied implications of developmental research. It begins by introducing the ways in which psychologists study developmental processes before going on to consider all major aspects of development from conception through to adolescence. Peter K. Smith is Emeritus Professor of Psychology at Goldsmiths, University of London. Helen Cowie is Research Professor and Director of the UK Observatory for the Promotion of Non-Violence at the University of Surrey. Mark Blades is Senior Lecturer and Director of Post Graduate Studies at the University of Sheffield. The new 6th edition has increased coverage in many areas, including ethics; children’s rights; participatory research methods; three models of human plasticity; breastfeeding and cognitive development; fostering; non-resident or absent fathers; parenting styles in China; effects of domestic violence on children; physical punishment, and child maltreatment; the development and fostering of emotional intelligence; homophobic bullying and cyberbullying; and developing intercultural competence through education. There are entirely new sections on immigration, acculturation, and friendships in multicultural settings; disruptive behaviour and oppositional defiant disorder; sexting; and adolescent bedtimes. The Adolescence chapter has been extensively revised, covering work on the social brain, insights from neuroscience, evolutionary perspectives on risk-taking and peer relationships, romantic development, and use of mobile phones and the internet. Extensive international coverage and a rigorous research-based approach. Each chapter provides lucid discussion of the material, enlivened by the inclusion of revealing case studies, real world examples, 'Stop and Think' boxes, and ideas for classroom debate.